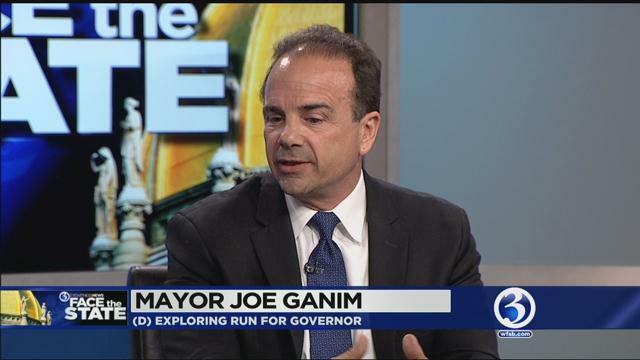 In a taping of Face the State set to air Sunday on WFSB, Bridgeport Mayor Joe Ganim announced he will file the papers Friday to open an exploratory campaign for governor. Ganim joins a crowded field of Democrats that is expected to grow between now and June. Ganim, who served nearly seven years in prison for corruption, pulled off a remarkable comeback in 2015 when he was elected to the job he held for five terms from 1991 to 2003. He was once considered a rising star in the Connecticut Democratic Party and a likely candidate for governor before his downfall. He was the party’s nominee for lieutenant governor in 1994. During the taping, Ganim called the budget situation in our state “depressing,” and told us he believes as mayor of the state’s largest city he is uniquely qualified to be governor, because he has balanced budgets without tax hikes. Ganim’s hometown was very forgiving, and the mayor hopes the rest of the state will feel the same way. Hear more from Ganim on Sunday, plus we are also joined by the Commissioner of Revenue Services Kevin Sullivan, who in a fascinating segment, talks about the big decline in income tax receipts, and about people moving out of state. Our flashback takes us to 1993, and Governor Lowell Weicker’s announcement that he would not seek re-election. See you Sunday morning at 11 on Face the State on WFSB . I would say that the job for gov.is no good for anyone especially when these people wasted so much 💰 over the years especially in jail.